“This charming Vrindavan possesses great power because its nature is pure consciousness, and it lies beyond the range of the physical eye, “tejomayam idam ramyam adrshyam carma cakshusha”. This most delightful Vrindavan is My only abode”. Can one attain spiritual perfection in one birth? Yes, but it is rare and usually takes many births of trying for it. In the Gita (7.19) Krishna confirms this by saying, “After many births, a wise man surrenders, “bahunam janmanam ante jnanavan mam prapadyante”. However, the Srimad Bhagavatam does mention three who attained Lord Vishnu and spiritual perfection in one lifetime of sadhana, namely Narada Muni, Dhruva and Ajamila. So keep chanting, serving, surrendering, crying and praying…and hope for the best! In his comments on (BRS.1.2.244), Shri Jiva Goswamipada says, “Concerning Deity worship, it is said: “If only once, even by force, one brings the form of the Lord into one’s mind, one can attain the supreme destination by the mercy of Krishna, “sakrd yad anga pratima antar ahita manomayi bhagavatim dadau gatim.” Ultimately, perfection entirely depends on the mercy Krishna. Many think that just by dying in Vrindavana, they will attain Goloka Vrindavana, their spiritual bodies, and the eternal seva of Radha-Govinda Yugala in the kunjas of Vraja. 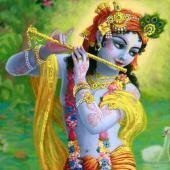 But, without a lifetime of intense and focused raganuga sadhana, why would Shri Krishna just give them a spiritual form? Gita 8.6 and all the Gaudiya shastras say a sadhaka will receive an appropriate ‘siddha svarupa’ based on the desires and bhava he developed during sadhana. The best way to spiritual perfection is to live in Shri Dham Vrindavan chanting the pure Holy Names of Bhagavan Shri Krishna, and practicing raganuga sadhana bhajana under the guidance of Shri Guru and Vaisnavas. One must always remember that Vrindavan is the divine abode of spiritual mercy, miracles and magic.